Retailers: You're selling items essential to a well-equipped kitchen, but the majority of them primarily aid in food preparation. Isn't it just as important - if not more important - that your customers be comfortable in their kitchens? GelPro anti-fatigue kitchen floor mats can help prevent the foot pain and lower back pain associated with standing on hard kitchen flooring. GelPro anti-fatigue kitchen floor mats are very easy to merchandize. 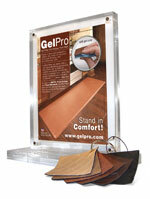 Typically our retail partners place a GelPro mat at the check out area for customers to stand on. Our unique and attractive Point of Sale display can then be positioned in a location where customers can read about the features while they are standing on the mat. This strategy has proven very successful at educating customers while demonstrating the product. Give us a call today to discuss how GelPro Mats can increase your revenue and delight your customers! For more information, please fill out our contact form and a Retail specialist will get in touch with you. Look for these displays at independent retailers across the United States and Canada.